INGREDIENTS:Rice, Seasonal vegetables, Salt, Teel, Oil. PREPARATION:Rice and lentils are properly washed and is left for 10-12 hours. After that the mixture is crushed. We add salt and chilli along with vegetables in the mixture.Now it is steamed till it gets cooked.We spread teel on the upper surface for decoration and better taste. 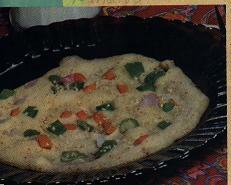 COMMENTS:Its very hygienic non vegetarians can use meat instead of vegetables.This dish is often served with pickles.